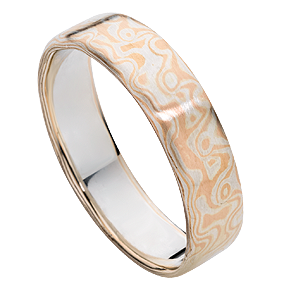 Mokume-Gane is becoming a popular choice for those who want a wedding ring that is a little different. It is a Japanese term which roughly translates as “wood-grain metal” named after its unique patterns which often resemble those seen in wood. The metal is made by layering precious metals of contrasting colour into a stack. This stack is baked in a kiln so the metals fuse together to form what is called a billet. The billet is then forged and shaped using a variety of techniques which cause the layers to twist and distort. As the metal is worked, the different colours come to the surface to form the individual pattern on the outside of the ring. The process creates slightly different patterns each time giving you a ring that is truly like no other. We have several colour combinations available, all lined with a precious metal inner sleeve. From our wide range of samples, you can select the colours of the sleeve and the Mokume along with the width and profile of your ring. It is even possible to make yours or your partner’s Mokume-Gane ring yourself in our Wedding Ring Experience.